The ShowDome at Our Dynamic Earth (ODE) in Edinburgh has been transformed with support from Electrosonic, which provided refurbishment and technical upgrades to one of Scotland’s premier destination visitor attractions. In a two-phase project, Electrosonic has given the space a full-dome projection upgrade, a new theater layout, 106 new seats, and a state-of-the-art server and content management system. 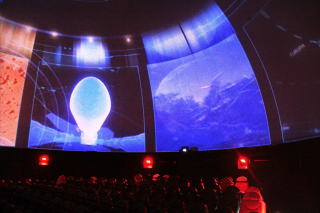 ODE showcases earth science by taking visitors on a journey through our planet’s past, present and future through interactive exhibits and a stop in the 14-meter ShowDome theater, which originally opened in 1999. Phase one of the project included replacing the former projection system with a system featuring five channels of LED projection. The existing seating was removed, the floor was reinforced and new tiered flooring was installed along with 106 premium seats, provided by Euro Seating, in a new forward-facing configuration. A stage was built at the front of the theater to support the needs of staff, corporate guests and presenters. Electrosonic also supplied new Philips lighting systems, including LED washes for scenic and mood effects, and spotlights for floor highlighting and on the stage. An insert projector display was added for digital presentations; a control system with an Apple iPad interface manages all media, lighting, audio and display hardware within the dome. In the second phase of the project, two 7thSense media server systems feed the projection of full-dome films inside the theater. One of the servers represents a new configuration, which eliminates the requirement for time-consuming slicing and encoding of large, full-dome masters for a multi-channel dome display. Because the media server plays shows directly from a large amount of primary storage, it can play from a large selection of archived shows – up to 35 30-minute shows in 3K format. This eliminates the need to move shows from a second-tier storage. But should more storage be needed, a secondary NAS server can easily be added with a capacity starting at 36TB. Transferring shows from secondary to primary storage now requires moving only one set of masters, which takes considerably less time than moving five channels of carved video. A new control interface allows portable touch control with multiple access layers. This provides control that can be limited to turning lights on and off, or extended through show control and full administrator access to the equipment and setup of shows. A main rack room houses equipment. The ShowDome is currently presenting “Supervolcanoes,” an immersive planetarium show that looks back at rare classes of volcanic eruptions and moves beyond Earth to explore the impact of giant eruptions around our solar system.